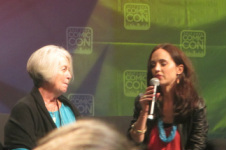 Eliza Dushku brought her mom Judy Dushku on stage to talk about the work that they do through THRIVEGulu, a charity founded by her mom that does work in Gulu, Uganda, Africa. The organization helps with the healing and rehabilitation of people involved in the Ugandan Civil War. “We help them to survive and to move on in their lives,” says Judy. When Eliza was in Uganda, she got the nickname “kumo.” She thought it was cool and that she was in with everyone there. On her next trip, she was sitting with a group of people and she asked what “kumo” meant. No one would tell her for like two hours. “Making an ‘R’ rated movie and having to tell you’re your bishop – that is a little awkward,” says Eliza about her experience in the church when she was a child. Eliza’s grandparents were Mormon, but they were also very accepting of people. Eliza says that the color of the person’s skin or the person’s sexual orientation didn’t matter to her grandparents. They not only accepted people for who they were, but they also stood up for them. “There’s lots of different ways to be strong,” says Judy Dushku. Eliza is a bow hunter. Eliza sang “I love cheese” and explained that she was raised not turn down food at someone’s house when she was invited to eat. It’s not really nice to say that she can’t eat something because she’s vegan. She does believe that “you should be able to hunt what you eat” because it’s part of the circle of life. Eliza Dushku is now a 33 year old freshman in college.